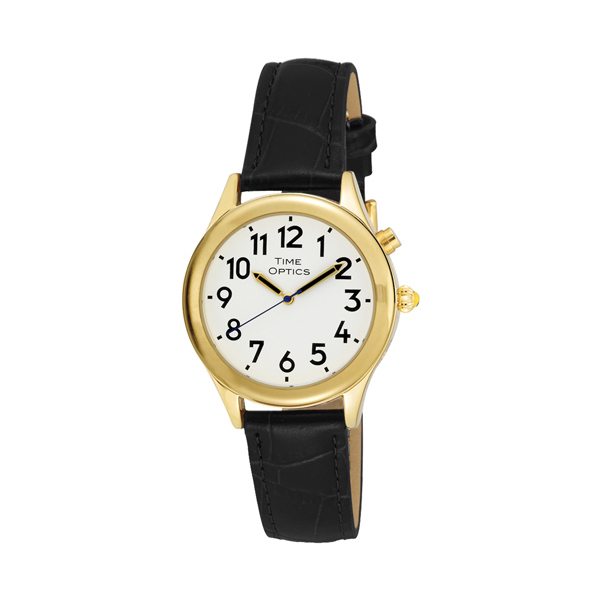 Our Ladies Talking Watch, gold tone, with Genuine Leather Black Croco grain Strap, is a timeless piece that is classic and stylish. Our Unique Dual Voice (male or female) Talking Chip with Alarm Feature is unique to our Time Optics Brand. The Black textured Croco Grain Genuine Leather Strap only adds to the beauty of the watch. The clean white dial with the black bold numbers and sapphire blue second hand make it easy to read, and our over-sized Pumpkin Crown adorned with a Cabochon completes the look of this watch. With a push of a button you can hear the clear voice which makes this watch ideal for people with low vision or just want a stylish watch.